November officially launches the holiday season, which is a busy time for guests and visitors. Whether your business picks up this time of year or your friends and family come over for holiday meals, it is important to provide a welcoming and inviting atmosphere. Your gates and entrances offer visitors the first glimpse of your property. Today’s homeowners and business owners are opting for entrance gates that can provide much more than security and safety. 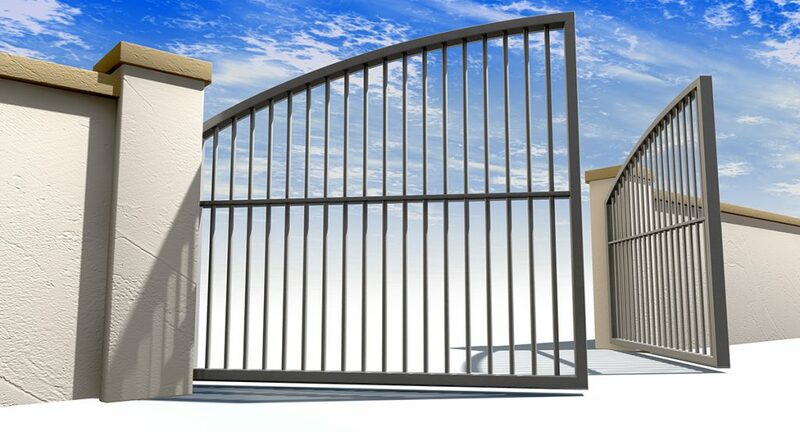 For example, Double R Manufacturing’s customers are requesting customized gates to enhance the beauty and uniqueness of their homes and businesses. Whether elegant with curved accents, monogramed with family initials, or personalized with artistic logos – Double R Manufacturing is setting new standards for gates and entrances. Beauty, of course, is in the eye of the beholder, which is why Double R manufacturing provides customers an array of design options, from an antique finish in bronze for your horse farm’s front gate, to a sleek black design for the entrance to your modern home. Would you like to welcome guests this season with a customized gate or entrance? We invite you to browse our past project designs for inspiration and contact us for limitless possibilities for your home, farm, or business. Through attentive service and beautifully designed products, Double R Manufacturing is ready to surpass your expectations with high-quality products and services. Call Double R Manufacturing today at (800) 813-3361 to learn more about our products and services. © 2019 Double R Manufacturing. All rights reserved.